A few weeks ago Colin had stopped by one of his client’s place just to touch base and say hello. It had been about 3 years since he had sold them the house and they had some reno’s and were anxious to show him what they had done. He’d been at the house for about 30 minutes before he noticed the standing by the fridge with one of the kids. He laughed as he noticed the 3 year old was pointing to the Thornton fridge magnet & looking at Colin. It appears this little one had somehow put the faces together and realized that the man standing in the kitchen was the same mad she saw on her fridge every day. Her dad explained “ when you were just a little baby, Colin helped us buy this home. This other guy is Colin’s dad and they work together. 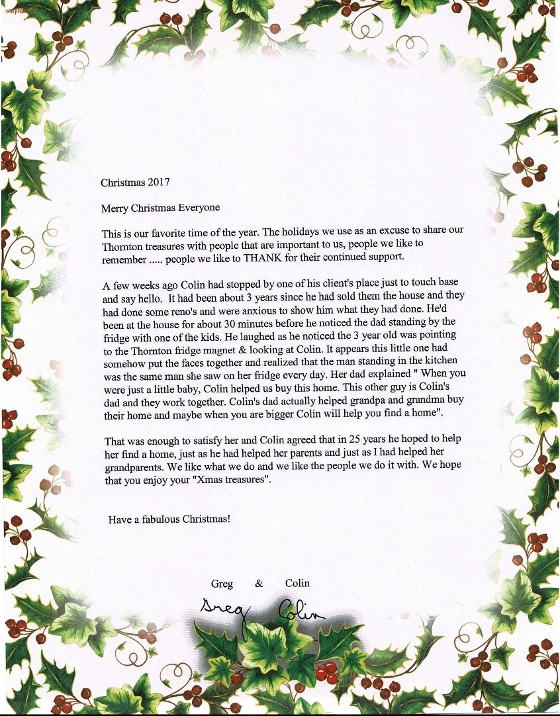 Colin’s dad actually helped grandpa and grandma buy their home and maybe when you are bigger Colin will help you find a home”. That was enough to satisfy her and Colin agreed that in 25 years he hoped to help her find a home, just as he had helped her parents and just as Greg had helped her grandparents. We like what we do and we like the people we do it with.